I stand outside a small two-floor apartment armed with two automatic pistols. Inside there are tens of armed thugs using an assortment of guns and melee weaponry. I’m here to kill them. Why? Not my concern. I’m not here to ask questions, only to get the job done and get out of there. 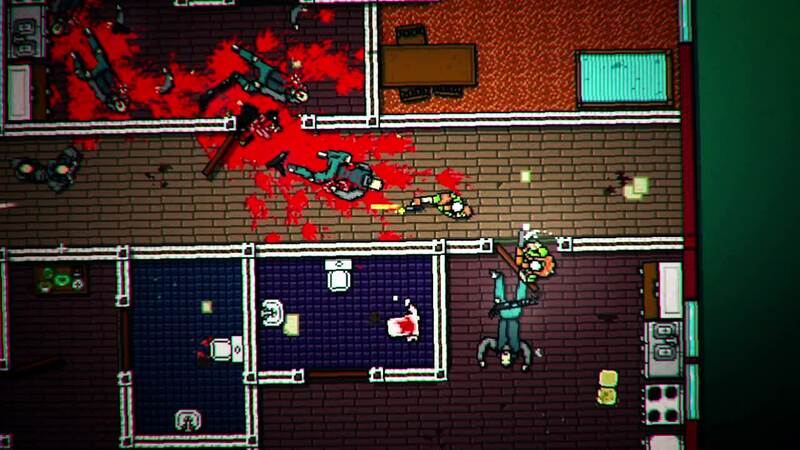 Hotline Miami is a game I don’t often question. Even in spite of its dark subject matter, I don’t concern myself with the nitty gritty details of why I’m essentially committing mass murder. Once I’m given control, adrenaline coursing through my veins, the hot synth beats of the music pumping into my ears, I turn my mind off and focus on the task at hand. I burst through the front doors and start unloading into anyone I see. Bullets fly as the enemy quickly emerges from all sides to investigate the noise, most of them armed with rifles or shotguns. Luckily, wielding two pistols allows me to fire in two directions with a simple press of the left trigger and back touchpad, which makes quick work them. I stop to admire my handiwork for a second then ascend to the second floor to clear the rest of the building. My pistols are almost out of ammo by this point, but I can’t discard them yet. Seems Bear – what I assume the name of that particular character I’m using is – has some sort of affinity for them. This floor is a pain. Right around the corner at the top of the staircase is a man with a shotgun trained on the hall. I manage to slay him easily most of the time, but once I do, four or five more thugs come running, what few bullets I have left not nearly enough to handle them all. Have to either be extra precise with my shots or try to swap weapons mid-battle. Either way, it’s an unfavorable situation. After several minutes of perseverance (hey, this game ain’t easy), I was successful. At this point, I was moved to another character. He’s sitting in the bathroom of a diner. As he leaves, one of the cashiers remarks that he doesn’t look so good. “Yeah, you wouldn’t believe what they’ve got me doing,” he responds. Then it’s off to his car and onto the next massacre: this time a convenience store, the demo’s final level. It goes smoother than the last one did, taking half the time to complete. This guy didn’t have any special abilities, far as I could tell. Made the level feel like a more traditional Hotline Miami stage in that I didn’t start with any weapons, forced to use whatever I could get my hands on. “Guns are loaded in the back of the van,” another replies. It was a chilling moment. The instead of mysterious phone calls driving these people to kill, they just decide to do it (at least as far as I can tell). There was no impetus for their actions. It sets a much darker tone for the story than I previously imagined. Makes me wonder where the hell things are going this time. Anyway, the van then pulls up outside their first target. I’m prompted to choose one of four characters represented by their masks. Tony, the leopard mask, for instance, can instantly kill foes with his fists but can’t use guns. Alex and Ask were the most interesting, however, as they’re two characters in one. The duo consists of one holding a chainsaw for close quarters combat and the other wielding a pistol. The right trigger controlled the former, the left commanding the latter. I didn’t make it very far with them, but they certainly proved to be an interesting way to play. I’m hoping such things will be the norm with Wrong Number. The last game was damn fine as is – Wrong Number would have been fine even if it was nothing more than a simple level pack because of it – but its sequel is so far doing all the right things to freshen things up. Looking forward to seeing how the final game shapes up.